Many of us can recite Sunset Boulevard’s iconic closing line, but who else has had it suggested as their epitaph? You see, I own—well, owned—the cemetery plot directly across from the famed director Cecil B. DeMille in Hollywood Forever Cemetery. It was to be the sign-off of a lifetime. Until, that is, I was robbed of my final resting place. But let’s start at the beginning. In 1986, as my 40th birthday approached, I bought a townhouse just a mile from what was then called Hollywood Memorial Park. The cemetery was known as the resting place for legendary stars and prominent Angelenos—even though the grounds were unkempt, crypts were crumbling, and there was talk of disinterment and bankruptcy. I had my eye on the plots near Tyrone Power as an homage to my mom (she took me to see her screen idol in The Eddy Duchin Story when I was a little girl). In their middle age, my parents and their siblings bought adjacent plots in a Jewish cemetery in St. Louis. My upbringing included planning for death as part of leading a responsible life, but I made no moves to purchase anything. Despite the allure of spending eternity so close to the place I now considered home, the grounds’ questionable future was my excuse for inaction. Then, on July 16, 2003, an 86-year-old man accidentally drove his Buick LeSabre through a barricaded street of the Santa Monica Farmers’ Market, killing 10 shoppers and injuring 63 more. That’s when it sank in: I (or anyone) could run out for asparagus, never to return. Hours later I dropped into Hollywood Forever. Upon my arrival, a sales agent—let’s call her The Counselor—drove me in a golf cart to the coveted Garden of Legends section of the cemetery. There, a white marble memorial bench for Power sits alongside a mausoleum for Marion Davies, the actress and longtime companion of newspaper tycoon William Randolph Hearst. Plots near my mom’s idol came with a $20,000 price tag—way too high for me. The Counselor then showed me a $5,000 plot across the roadway from DeMille. Seemed like a deal. I asked her to hold it for me until the next day. With that I returned to pay for the plot near DeMille, and The Counselor started her pitch for me to prepay for other funeral necessities. According to her, taking care of these things early on spares loved ones from a grim task during their time of grief. Details included grave fees and concrete container and, of course, the casket. A simple pine box seemed too spartan, so I chose a light-colored, low-end glossy poplar one. I looked at its satin lining only long enough to remind myself to live every day fully, then hoped I could forget the entirely morbid experience of picking out one’s own coffin. Altogether, the funeral contract cost just over $4,000, including the “Simplicity” package for services. But in Hollywood, even simplicity has flair. I was instructed to gather family photos and a few favorite tunes so I could work with the cemetery’s producer and camera person to make a three-part video series about my time here on Earth. If you go to the LifeStories section of Hollywood Forever’s website, there I am, eerily recalling my own existence as if I were already dead. Purchasing a burial plot in my fifties put me in a growing category of what the death industry terms “pre-need.” But planning for eternity at middle age isn’t as uncommon as you’d think. 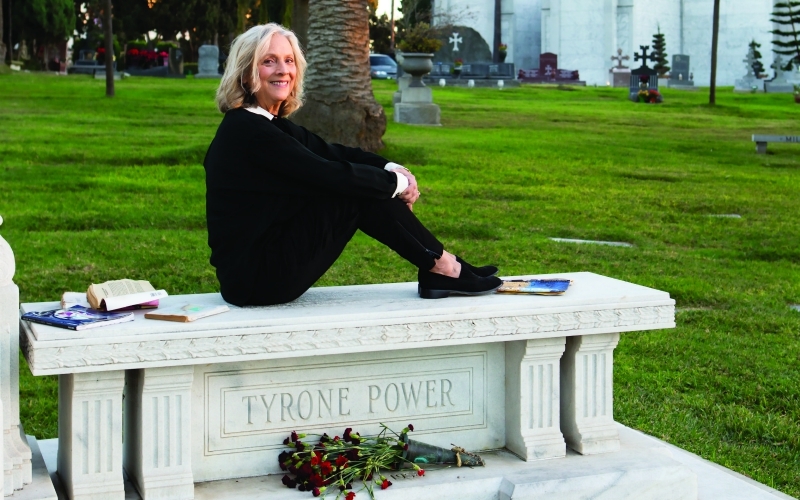 “Hollywood Forever sells as many pre-need plots as at-need,” Tyler Cassity says. “Many people find psychological and economical benefits to taking care of these arrangements in advance.” The economics part makes sense: Like all real estate, burial plots tend to appreciate. At Hollywood Forever, spaces now range from $18,150 to $242,000, some up as much as 400 percent from when I bought in. Astronomical as that may sound, it’s in line with other elite local cemeteries. Westwood Memorial Park, where Hugh Hefner recently joined the remains of Marilyn Monroe and Farrah Fawcett, prices plots at $199,000 on up; wall crypts are a bargain at $40,000. The psychological benefit is there, too (my advice would be to settle your business sooner rather than later). Dealing with this at middle age was a whole lot easier than when I was pushing 70, an age at which mortality looms like a specter. Unfortunately, planning ahead got me only so far. When I returned recently to research this essay, I learned that there had been a mistake: Apparently The Counselor—no longer an employee—had recorded the wrong plot number on my forms. In the intervening years my enviable and affordable spot across from DeMille had been resold to someone else, and I had been inadvertently demoted to a plot three rows back. The revelation was traumatic, but I took comfort in the fact that I was still alive and able to fight for my rightful place. In the throes of my distress, I talked to several lawyer friends who assured me I had a strong claim. If the land was sold to me first, it was not Hollywood Forever’s to resell. On the other hand, contract law would seem to favor the couple who holds the deed that bears the correct grave number. Going to court over my future grave site wasn’t exactly on my to-do list. Cassity wasn’t keen on the idea either. As a remedy he instructed that I be shown several potential new resting places, all nice but none in the prime part of the Garden of Legends, where lakeside real estate that was $20,000 when I first looked at it sells for $125,000 today. Back on the golf cart, my new counselor pitched a plot across the road from John Huston, enthusiastically declaring that Huston was a better director than DeMille. I laughed and couldn’t disagree, but the mere mention of DeMille put me in touch with my emotional attachment to the spot I thought I owned. I countered that the couple who was given my plot should spend the afterlife in the free upgrade near the better filmmaker and I should be laid to rest near the overrated DeMille. The idea was floated to the family, but they wouldn’t budge. After weeks of fretting, it dawned on me that before DeMille had entered the picture, my first choice had been to be buried near Tyrone Power. So I made a proposition to Cassity: I’d forget the whole snafu if he upgraded me to the Garden of Legends near my mom’s idol. I sweetened the deal by offering to pay an additional $15,000, the original up-charge over the site I’d bought in 2003. To his credit and my relief, he accepted my terms, and off we went to scout the options. He suggested a place just yards from Power’s bench, in the shadow of Davies’s mausoleum and in front of Charlie Chaplin’s mother. We had a deal. I joked that perhaps I’d adorn my spot with a pot plant now that California has legalized recreational marijuana. “I have no problem with that,” Cassity said with a laugh. Once my new arrangements were made, I renewed my vow to have as much fun there above ground before going under. I’ve stuck to it, hearing Joyce Carol Oates read from her new novel in the Masonic Lodge and attending a Johnny Ramone tribute fund-raiser. As often as possible I join the 30,000 Angelenos who attend the annual Dia de los Muertos celebration. In meticulous face paint and costumes, the attendees are part of the spectacle as they pass by some 100 colorful and sentimental altars amid the head- stones. Which brings us back to the epitaph. Being that I’ll no longer be buried across from DeMille, the “close-up” line is out. “Hipper dead than alive” currently tops my list, less in recognition of my esteemed neighbors-to-be than as an appreciation of how Hollywood Forever joyfully bridges the gap between the dead and the living. But I’m open to suggestions for a great one-liner. Anyone?